This is the perfect home for either a full time residence or a part time getaway. Very low maintenance and in move in ready condition for you to start enjoying right away! 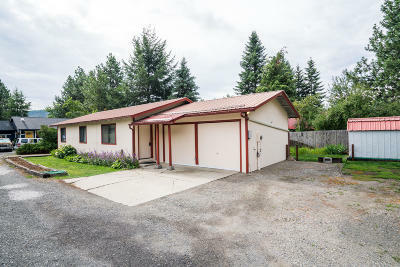 Very well kept rambler for one level living has been updated with new paint and flooring! Nice deck to enjoy the private back yard and mountain views. Very quiet setting on a small private drive. Great in town location and easy walking distance to schools and shopping. 3 bedrooms and 2 full bathrooms with an open living area. Office room in one bay of the 2 car garage but can easily be turned back into garage space if that is what you are needing. Storage shed in the back yard is a nice bonus. This is the perfect investment property if you are looking for a rental investment in Leavenworth.